Music Academy – the place where it all started, 85 winters ago. The pre-eminent sabha in Madras; a rich sense of history. The digital archive here has several thousand hours of recorded music, including live concerts of many stalwarts. A must-do. Sri Parthasarathy Swami Sabha – located in Triplicane, this is the oldest sabha in the city. Again, a rich sense of history. More than a century old. Kalakshetra, near Besant Nagar – all performances are conducted in the koothambalam (a Malayalam word for ‘performance arena’). With its greenery, fresh air and open spaces, it transports you even before the music begins. The Mylapore Fine Arts Club – for its old-world ambience. The set-up is basic, yet very comfortable. This is how Carnatic music is actually meant to be imbibed. Vani Mahal (Sri Thyaga Brahma Gana Sabha), Sri Krishna Gana Sabha and Narada Gana Sabha – all of them offer an excellent line-up of musicians, comfortable seating and very good acoustic systems. 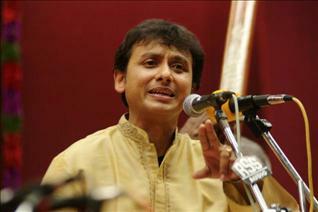 Grab a copy of The Hindu’s special supplement on 1st December and Kannan’s booklet of concert schedules. Both are invaluable ready reckoners. Kannan’s booklet is available at the Nalli Silk Store outlet adjacent to Panagal Park in T. Nagar and at his residence (which, I hope, can be traced through Google). Pick out the artists you want to listen to or watch and look up their concert timings in advance. It pays to plan ahead for the next three or four days. Try to attend at least one concert each of T.N. Krishnan (violin), R.K. Srikantan, R. Vedavalli, Parassala Ponnammal, Nedunuri Krishnamurthy (all vocal) and N. Ramani (flute). These are my favourites. They belong to the old guard and have been upholding traditional values and tenets of Carnatic music. Their music has a distinct old-world flavour, which I find charming. 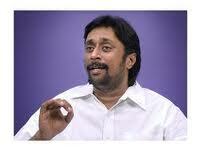 Among the younger lot, don’t miss U. Shrinivas (an absolute wizard with the mandolin), T.M. 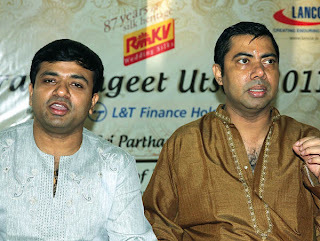 Krishna (vocal), Malladi Brothers (vocal), Sanjay Subrahmanyan (vocal) and Bombay Jayashri (vocal). At every sabha you visit, try to sample the culinary fare at the canteen. Trust me, you will rejoice! Treat the traditional South Indian filter coffee with respect. The best way to show respect is to consume at least three cups of this heavenly brew everyday. 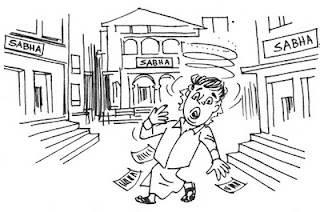 When in doubt, ask a local for directions to a particular locality or sabha. The denizens of Madras are friendly and more to the point, quite good with directions. The December Season is the time when Madras or Chennai celebrates its classical culture. There’s so much of music, dance and related activities happening in the city – you simply can’t keep track of them! You not only have kutcheris but you have talks on music, and walks on music and dance. The Chennai Music Season is one of the greatest music and dance shows on earth. It is powered by individual initiative and by organisations – there is virtually no government support. It has about 200 organisations hosting about 3000 programmes. Though called the December Season, it has grown like a balloon to encompass the months November to February. In Sruti we called the four-month long ‘festival of festivals’ the mad mad Madras Season, and presented a statistical analysis year after year. What started as a one-page table on the season in 1990 grew over the decade to more than six pages! We stopped publishing it because, at this rate, the pages of the magazine would have had nothing but the season table! During the season, the city gets into the grip of a cultural fever. It is not an integrated festival, but a series of parallel self-contained events conducted by different organisations. The Music Academy was inaugurated in 1928 and held its first conference in 1929. Then came the Indian Fine Arts Society in 1935, and the Tamil Isai Sangam which held its first conference in 1943. The famous writer Kalki Krishnamurthy then lamented that holding three festivals at the same time did not make sense. Wonder what he would have written today with the number of organisations holding festivals crossing the 200 mark and some sabhas conducting more than one festival! The Music Academy introduced the concept of holding a Sadas and honouring artists and scholars. This was the humble beginning of awarding titles – now we have titles galore! Titles are given to musicians and dancers – young and old, to scholars, patrons, those involved in allied activities, and even to rasikas. Throughout the 1940s and 1950s several sabhas were launched, but the 1970s saw the boom in sabha culture. The new and the old sabhas conducted festivals in December which spread the season all over the city with hundreds of performances at the same time. As a result, every hall – big or small gets booked for programmes. Marriage halls too are now blocked by sabhas. The season attracts a host of NRIs: both artists and audience. You even have special NRI festivals. Hotel rooms are booked, tickets are sold out months in advance. Of course, you can get daily tickets if you have the energy to stand in the queue to buy it and then again to go in a queue into the hall! The recording companies and the media too have been cashing in on the music season. It is a heady mix: You have free kutcheris from morning to noon, and ticketed kutcheris in the evening. You can watch a variety of artists – from little prodigies to 90+ pedigree musicians. MUSIC – vocal, instrumental, instrumental ensembles. You can listen to traditional instruments like the nagaswaram, veena, chitraveena, violin, flute, as well as the new ones adapted to Carnatic music like the mandolin, saxophone and the keyboard. DANCE – you can watch solo dance, group dances and dance-dramas. In solo we have the traditional margam – alarippu to tillana format – and the thematic presentations. Canteens, of course, are the greatest draw of the Season. The Canteen is THE place where you can catch a lot of gossip. The menu is very attractive and sometimes even better than the music menu offered inside the hall! Manoharam, Soorya, Sooryakala, Chandrakala, Chandrakauns – if ragas have novel names so do the dishes. Its hectic from morning to night during the Season – specially from 15th December to 2nd January. Devotional Music – Years ago there was the Margazhi bhajanai around the Mada streets of Mylapore led by stalwarts like Papanasam Sivan. We now have devotional music and discourses inside the halls: Udayalur Kalayanaraman, Visakha Hari, and Jayakrishna Dikshitar are some of the big names. A number of ladies groups too are given opportunities to sing in the early morning slot during the season. 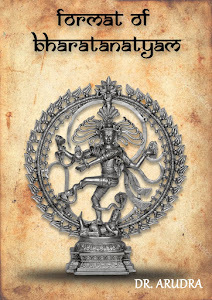 Lecdems – these range from the simple to the complex – aharya in dance to shatkala pallavi and the mind-boggling Simhanandana tala. The noon kutcheris are allotted to concerts by juniors and sub-junior performers. Music and dance are held in the afternoon. The artists could be of any age, but are not star performers. Stars are invited to perform in these ticketed slots which bring in revenue to the sabha. Two concerts are generally held in most of the venues – either two music or dance recitals or one of music and one of dance. There was a time when concerts went past midnight – when Hindustani stalwarts like Pandit Ravi Shankar would herald in the New Year. 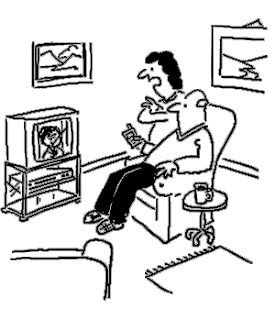 Traffic jams, parking problems, commuting and change in eating habits, predominance of old people in the audience, have all advanced the finishing time of night concerts to 9.30 pm. There is generally a ‘walkout’ at 8 pm. In a dance recital there is an exodus after the varnam. Similarly, you can see the audience making a beeline for the exit during the tani avartanam in a music concert – not a good trend. There seems to be a change for the better now! 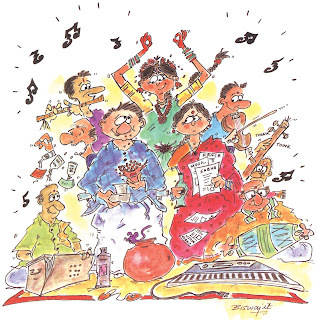 There are many kinds of rasikas – the single-minded one-sabha rasika, the sabha hoppers, the talkers, the sing-along and tap-along types. If you are crazy you can follow your favourite musician to all the 20 + concerts where he or she is performing. Musicians say the season concerts become benchmarks for them to live up to until the next season. On stage, the décor, acoustics and sartorial tastes of artists have undergone a change for the better during the season. Off stage you can see the flowing silks, sparkling jewellery, sherwanis and kurta pyjamas, colour coordinated couples, stylish mamis and bindaas youngsters moving in and out of the halls. But everything is not hunky dory about the Season. It is almost like a cultural cyclone. Does it lead to overkill? Of plenty beyond the human capacity to absorb and enjoy? Is quantity achieved at the expense of quality? Does it promote mediocrity? Do the performers suffer from overexposure? Has sponsorship affected the choice of artists? The Season is a grand exhibition. You can take what you want and leave the rest. It is a good time for critics and connoisseurs to observe and analyse the trends in music and dance, and observe how the same raga, song or dance composition is handled by different artists. You can listen to some Hindustani music too. In dance you get to see a variety of dance forms – from our very own Bharatanatyam, to Kuchipudi, to Odissi, to Kathak, Chhau, Kathakali, Mohini Attam, et al. The audience for music is quite different from that for dance. Only a few go to both! I wonder why? Nothing succeeds like Success! But as far as the Season goes – Nothing Exceeds like Excess! The merry show goes on and the illusion continues. It is a grand gala showcase of talent, virtuosity and versatility. The Chennai Music and Dance Season is above all an affirmation of our strong cultural roots. It isn’t December yet, but the music season is settling down on my life. Relatives and friends from outside Madras call me with their travel and ticketing plans, my teacher and I discuss and re-discuss his concert schedule every time we meet, there are emails in my inbox with offers for live and recorded webcasts of concerts, I find a link to this blog on my facebook feed, and the strains of a nagaswaram playing a surreal Nattaikurinji wafted through the air at a friend’s wedding. When Vyasarpadi Kothandaraman played Nattaikurinji yesterday, oblivious to the indifferent audience, from a neglected corner of a cavernous hall, the celebratory cacophony of the wedding melted into irrelevance. I sat in a corner and found myself drowning in a deluge of beauty. An idea is thrown into the air, a ma ga sa phrase for instance. A contemplative silence is succeeded by development of this same phrase - a sa ri ga ma ga sa. Variations on this theme come in a torrent - twisting, twirling notes coiling around one another, only to untangle themselves at the original ma ga sa. He wasn’t building a structure brick by brick; he was a painter drawing rough outlines and filling in the details with an assured hand and vibrant flair. The alapana proceeds for a while, ten minutes, or perhaps twenty, I don’t really know. Time becomes fuzzy by now. I wonder if I should request him to play my favourite Nattaikurinji song, Ekkaalatthilum, but I don’t want to disturb him. He starts a song I don’t recognise, and barely gets past the second sangati of the pallavi when my trance is broken by a sudden, heavy, unmindful pounding of the tavil and a loud, continuous tara sthayi sa from three nagaswarams in unison. 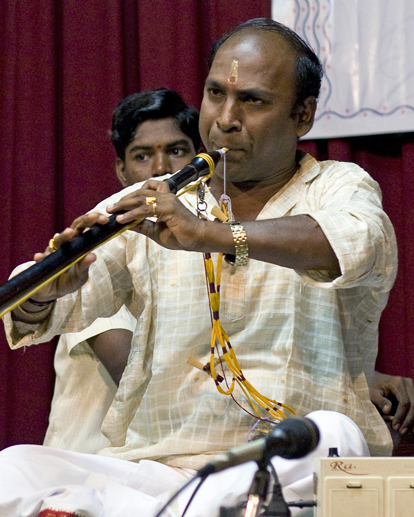 Wagging his finger from fifty metres away, the priest has cruelly transformed the nagaswaram from a musical instrument to an alarm-like device that attracts people’s attention to the stage. The Nattaikurinji never reaches the same heights again, and the tussle with the priest becomes the theme song of the morning. Surely there are better ways to attract people’s attention? Any music rasika worth his salt also knows that the Chennai music season is also a food festival. In fact more people visit the sabhas during the season for the gastronomic experience than the music on offer. In recent years, the Gnanambika catering service at the Narada Gana Sabha has been the popular choice, beating the nearby Music Academy canteen in a canter. Jayarama Iyer and his family are a cheerful and hard working presence at the canteen behind the NGS auditorium, where they play their own music in a muted public address system, mostly comprising devotional music in which OS Arun’s bhajans are prominent. Two of the sons also double up as waiters, providing their own background, music as well as slokas in praise of Radhe Krishna, sometimes taking the diner completely by surprise just as he is wading into his favourite Asoka Halva or Rava Dosai. One aspect of this month-long feast of food for the soul and food for the stomach will soon gain considerable significance, especially in the wake of the persistent rains of the season. It is not uncommon for both rasikas and performers to catch stomach bugs that lay them low for a while. It is time strict hygiene standards were enforced at all the sabhas during the festival to avoid the recurrence of such setbacks to the total enjoyment of the greatest musical show on earth. The question is, who will assume the responsibility to ensure the maintenance of the highest standards of hygiene in the food stalls of the sabhas without exception? 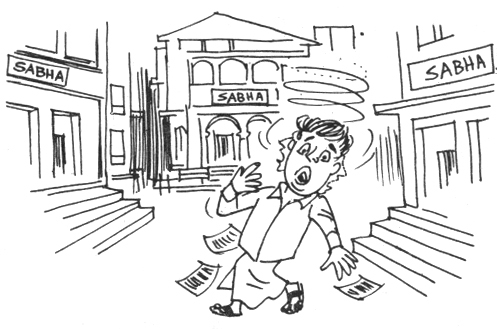 Ideally, the sabhas should subject themselves to the strictest scrutiny in this regard. “Carnatic music is alive and well”, seems to be the verdict of most enthusiasts and critics, who shower their praises on the ‘genius’ and ‘versatility’ of our top performers, as yet another season draws to a close. The dance scenario too drew favourable comments all round. There are a few exceptions to this popular view, with some senior citizens, especially among critics, holding the view that the present day practitioners of both these arts are not a patch on the stalwarts of the past. In balance, the general run of reviews from both Sruti staffers and others, indicates that the recent season offered good performances overall, but none of them seems to haves potted any major new talent. Veterans R. Vedavalli, R.K. Srikantan and Nedunuri Krishnamurthy gave standout performances, steeped in tradition but lacking in none of the elements of a polished, accomplished, contemporary kutcheri. According to one of our correspondents, they proved that “vidwat gained with age and experience can deliver great music with the right mix of composure and technical virtuosity”. The stars of today did not disappoint, with the likes of T.M. Krishna, Sanjay Subrahmanyan, Vijay Siva, Bombay Jayashri, and Ranjani-Gayatri rising to the occasion repeatedly despite the stupendous demands on their stamina and endurance. The major gain from the music season was the display of an abundance of talent among violinists and percussionists. This trend would surely support the views of the optimists who see a rosy future for Carnatic music. But junior musicians, including many talented youngsters, almost always performed before poorly filled auditoriums. 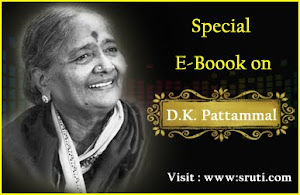 Many vocalists created a good impression with their pleasant voices, good pathantara and intelligent presentation, but missing in most of them was depth of bhava, according to critics. Where are the new Sanjays and Vijay Sivas, Jayashris and Nithyasrees, asked many rasika-s who recall having to stand outside overflowing halls to listen to these present day stalwarts in their debut seasons a decade or so ago? ‘Tamil’ music received a fillip this season too, with Kartik Fine Arts hosting the Tamil Isai Festival in Anna Nagar, in addition to the customary celebration at Raja Annamalai Hall. By and large, there seems to be an increased awareness of the aesthetics of stage decor all around, to go by some of the reports we received, though a few of the major venues including the Music Academy showed an unwelcome departure from good taste, with their loud, even gaudy decors. Acoustics again was an area of improvement this season in some of the main venues, though here too we are a long way from approaching the ideal. “The rustle of the day’s Kutcheribuzz newssheet and the cell phone buzz from all sides were extremely disturbing to the serious listener,” says one of our correspondents. “Apart from those speaking into their cell phones, there were quite a number of youngsters continuously tapping away sms’s, the clicking sound irritating. Are they even aware of such a thing as concert etiquette?” she asks indignantly. Here is an unusual take on the incomparable MS as we go into the latest Chennai music season. How I dreaded those 3 o’ clock Sunday “tiffins” at Vijaya Mami’s house when I was a little girl! Nose in a book, I would be shooed into my mother’s room and manoeuvred into a pavadai chattai, hair oiled and woven into a single, thick braid by my granddmother. Then we would leave, all three generations bedecked in jasmine and silks, for the Nungambakkam home where Vijaya Mami lived. A sprawling kolam embellished with peacock plume and lotus flower, the original handiwork of Babuji (Rukmini Krishnamurti, the late Kalki Krishnamurti’s wife, and my great grandmother was given this nickname by a grandchild), adorned the front yard of the house. Up the steps and through the iron grill, you could see all the way to the backyard while you waited for Vijaya Mami (younger daughter of M.S. Subbulakshmi and Sadasivam) to unlock the sliding door. The house was cool and dark, with red sandstone floors, and the tiny living room in which we all gathered smelled of incense, freshly picked flowers, and Vijaya Mami’s divine cooking. On top of the old-fashioned gramophone radio, the room’s centrepiece, adorned with hibiscus and yellow sampangi, sat a large black-and-white photograph of Kalki Thatha. Babuji’s daily ritual included dusting the mantel and decorating her husband’s photograph with festive blooms, which you then dutifully admired. Some weeks, Ammu Paatti (MS) was already waiting for us with Radha Akka (her older daughter) in the family room, exclaiming with delight as each group of visitors entered. While Vijaya Mami bustled (I don’t ever remember her sitting down!) and Babuji pottered, we sat cross-legged on the floor, ready to partake in tiffin and communal song. 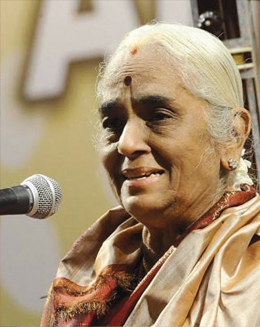 Kadayanallur (Venkataraman) Mama, a longtime friend and composer of many of Paatti’s most famous tunes, was a much-awaited presence. Entering silently and leaving equally unobtrusively, he would reluctantly elaborate a raga (sometimes Valaji, sometimes Kambhoji) at Paatti’s repeated requests. “Enna karpanai, aha! Ellarum kelungo!” (What an imagination! All of you listen), Paatti would exclaim. Sometimes, we would practise an oonjal song composed specially for a family wedding. Other times, Paatti would render a new kriti that Kadayanallur Mama had recently set to tune. More relaxed than at a concert, she would surprise you with an Akbilandeswari (Dwijavanti), always insisting that the entire congregation join in the singing, and smile at the child of the same name in front of her. (For years, I thought this song was about me!) More often than not, Paatti would break off mid-phrase to ask, “Vijaya, inniki kartala enna samaiyal?” (Vijaya, what did you cook today?) or “Anandi, Ambi saukhyama?” (Anandi, how is Ambi [Ramachandran her husband and my grandfather] doing?). 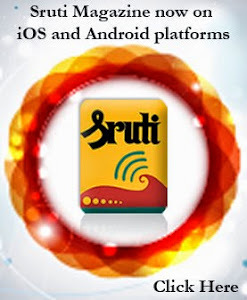 Reminiscences past and stories present, of homes and husbands, children and chores, would then be exchanged over the drone of the sruti box. Throughout these teatime sessions, piping hot coffee would make the rounds, followed by pinktipped strands of jasmine coiled onto banana leaves. Babuji would distribute kalkandu (little sugar crystals) or bananas or kadalai/ellu urundai (candied peanut or sesame brittle). The piece de resistance was Vijaya Mami’s superb tiffin that always came at the end: steaming idlis with fragrant sambar and chutney, buttery adai or spicy upma, whisper-soft dosas crisp around the edges, or milagu aval redolent of freshly ground black pepper and curry leaves, made the way only Vijaya Mami could make it. I went to Sunday tiffins mutinously through my teenage years, not knowing I would recall these occasions misty-eyed, as symbols of an era past in which women gathered to exchange the small joys and woes that made up their daily lives. A feminist scholar, I have come now to recognize those musical moments as a celebration of “women’s ways of knowing”. Seeing Paatti and the other redoubtable women of her family interact in such intimate spaces has been my great good fortune. As I ignore a light drizzle and set out on my morning walk, I see an intrepid muffler-clad warrior braving the bitter cold of November Madras. The lady is well equipped for an Antarctic expedition, but of vital significance is the secure wrapping she has subjected her ears to, allowing no entry to the treacherous winter wind. I immediately experience the familiar goosebumps of the seasoned concert-goer of the Madras cutcheri season in withdrawal, someone whose poor time management skills have denied him the pleasures of month-long sabha-hopping for some Decembers running now. For who doesn’t know that the time the Madrasi brings out his or her winter finery is the time the Seshagopalans and Unnikrishnans have to keep their fingers crossed and throats hot-water-gargled to do battle with their audience of mamas and mamis swathed in their warm woollens and swirling silks, and entice them away from their copies of ‘Kutcheri Buzz’, distributed by overzealous volunteers just before the start of the concert? It’s early days yet for the migratory birds from all over the world to gather at the Vedanthangal bird sanctuary but it’s the time of the year overseas Indians swoop down on Madras. In the past, they came to listen and watch; today some of them come to sing and dance as well. While the rest of sabhadom is in the throes of scheduling concerts featuring the top stars, Hamsadhwani of Indiranagar showcases NRI music talent! NRIs are not the only strange birds the season brings to Madras. There is quite a sprinkling of foreign nationals dotting the scene, ranging from wide-eyed seekers of nirvana to serious scholars of music and dance whose thoroughness and dedication can shame the best of local students. And if you read the programme cards carefully you will see that some of the morning lec-dem sessions are by experts from quite distant lands. 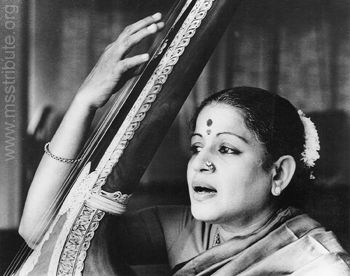 Many great artistes of the past have passed on and we shall miss them sorely, and I don’t mean the big stars of Carnatic music and dance alone. Many solid performers, composers and teachers who were an integral part of the music scene have left us. We’ll miss them. But this is no occasion for grief. It is celebration time. The usual excitement of anticipation catches up with you. The young tyros you watched make their spectacular debuts a couple of decades ago are today masters of their art, occupying centrestage where once was an earlier generation of stars. 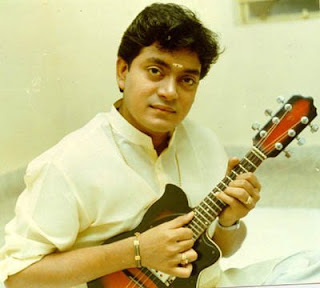 The sensational teenager who took Madras by storm in the 1980s with his tiny mandolin. U Shrinivas, is today a seasoned veteran, while an earlier child prodigy, Ravikiran has mellowed with the years to deliver music of surpassing beauty with his ‘chitravina’. (Ravikiran will perform only once this season, at the Music Academy, thanks to some compelling commitments abroad). Another prodigy of a later vintage, Shashank, today explores brave new paths with the flute, deeply moving one moment and frenetically fast-paced the next. Will the new season throw up some exciting new talent offering similar magic, you wonder. As always, there will be some variations of the theme, for those who seek a change from the standard cutcheri fare. That brilliant Carnatic violinist Sriram Parasuram will also perform Hindustani-Carnatic vocal jugalbandis with wife Anuradha Sriram. 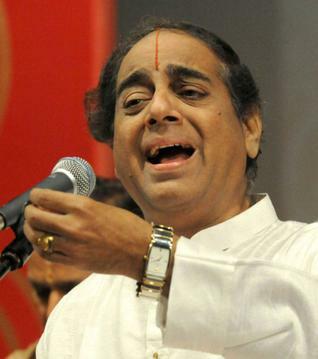 O S Arun will probably sing Tamil ghazals. A number of percussion ensembles will thrill lovers of rhythm, led by such laya wizards as Karaikudi Mani, Vinayakram, Tiruvarur Bhaktavatsalam and Karthick. For those harking back to the past, who knows, there may be a four-hour vocal concert or two-by the Malladi Brothers, TN Seshagopalan, or TM Krishna. In today’s world, virtually any programme can be viewed on the internet for free. A concert in some remote area of Kerala is made accessible to the entire world with the help of a video camera, laptop and a data card through ‘webcast’. Webcasting originally started in Carnatic music concerts, and today conferences of corporate companies are being webcast. It has grown so much in magnitude and importance that if you type “webcast” on Google search I am sure most of the events are from India. Webcasting, however, has its pros and cons. People around the world, who crave to see the visual and performing arts, get access and an opportunity to listen to or watch their favorite artists while sitting in their living rooms, miles away from the event. Some programmes are webcast free; some for a small fee which is easily payable through online transfers or PayPal. There are many artists who webcast their concerts on their websites for their fans across the world. The quality of webcasts is a factor in its favour. The clarity of the relay, both audio and video, adds a lifelike dimension. It sometimes provides a better view of the artistes and their interactions on stage, and gives them a feeling of watching the performance live. For office goers, it is convenient as they can catch a glimpse of the performance as and when they want to. A ‘homemaker’ too can relax and enjoy the performance, even as she is attending to her chores. It adds an extra dimension to many people’s lives as they get the best of both worlds. However, it is a fact that nothing can replace the ‘live experience’ or the joy of being ‘in the moment’ with the artiste at a concert. The rapport and ‘connect’ can be established only by being there. Though rasika-s across the globe benefit through webcasts, what about the rasika-s, who are in the same city where the actual concert is taking place? What will happen if they decide to sit at home and catch the concert in comfort on their home computers? We must remember that the performing artist ultimately sings for the audience in front of him and not for the ‘millions’ who may watch it online. The artist is motivated by and draws his energy from the people in front of him and their response to his art. This will be lacking in a webcast concert. If there is a way by which specific areas can be blocked access to the concert, then webcast is welcome. Also, I feel that the attention span of the listener is more concentrated and focused when he or she is present at the venue. The intensity of the performance, the atmosphere created by the artist and the overall feel, is something that people come to soak in. Besides the fact that you are in a different ambience, you can be distracted by several things while viewing the concert on the computer. An important question is – Should all performances be made available on the public domain? One of the main reasons why we get ten times more crowd at concerts held in December as compared to the rest of the year, is because it is the time when almost all the artists strive to give of their best. Rasika-s travel from different corners of the globe to experience what they have missed during the year. Would these people be willing to put their life on hold and travel all the way if the same music, dance and drama were made available to them all round the year? Isn’t not getting to listen to enough live concerts one of the main reasons why audiences flock to the December Festival? These are questions that can be answered only with time.